Geologic Map of the Lehi quadrangle and part of the Timpanogos Cave quadrangle, Salt Lake and Utah Counties, Utah: Utah Geological Survey Map 210, 2 plates, scale 1:24,000. Geologic Map of the Jordan Narrows quadrangle, Salt Lake and Utah Counties, Utah: Utah Geological Survey Map 208, 2 plates, scale 1:24,000. Interim geologic maps of the Copperton, Magna, and Tickville Spring quadrangles, Salt Lake and Utah Counties, Utah: Utah Geological Survey Open-File Report 434, 4 plates, scale 1:24,000, CD. The maps are available at the Natural Resources Map & Bookstore. Imagine a mountain range, virtually unknown to the hundreds of thousands of people who live within its shadow and to the countless tens of thousands who commute through it twice daily. Do the names Red Rock, Potato Hill, or Hog Hollow (where early pioneers once let hogs roam in an effort to control the rattlesnake population) register in your mind? Perhaps you know of Jordan Narrows, which divides the range in two and now serves as a major transportation and utility corridor; Pony Express riders used to traverse the Narrows, often faster than we are able to today in commuter gridlock. These and other place names find their home in the Traverse Mountains, an east-west-trending range of low hills that separate Salt Lake and Utah Valleys. While the Traverse Mountains lack the grandeur of the adjacent Wasatch Range, geologically speaking they are far more interesting than their sage- and oak-brush-covered slopes suggest. They are also at the forefront of explosive suburban growth. The mix of local geology and development pressures clearly demonstrates the need for detailed geologic maps of the Traverse Mountains, which were recently completed and published by the UGS. In broad terms, the geology of the Traverse Mountains can be viewed in three parts: (1) Late Paleozoic shallow- marine rocks, now exposed as large northwest-trending folds, record one small part of the collision of the North American continent with the ancestral Pacific Ocean basin in a mountain-building event that geologists call the Sevier orogeny, (2) a variety of middle Tertiary intrusions, associated volcanic rocks, and younger basin-fill strata deposited over the eroded Sevier orogenic highlands, and (3) Basin and Range extensional tectonics and the evolution of the modern Traverse Mountains. The oldest widely exposed rocks in the Traverse Mountains are those of the Oquirrh Group, a vast thickness of sandstone and limestone laid down in a shallow ocean basin. Sedimentary structures such as cross-beds, and reef-building fossils such as bryozoans, corals, and crinoids, show that these strata were deposited in relatively shallow water as the deposi tional basin slowly subsided, eventually accumulating up to 25,000 feet of strata. This group of rocks takes its name from the Oquirrh Mountains, where they are well exposed; Oquirrh, pronounced “O-ker,” is a Goshute Indian word meaning “wooded mountain.” Geologists have subdivided the Oquirrh Group into several formations and informal members, which allows a more detailed assessment of the structure and geologic history hidden within this great thickness of rocks. 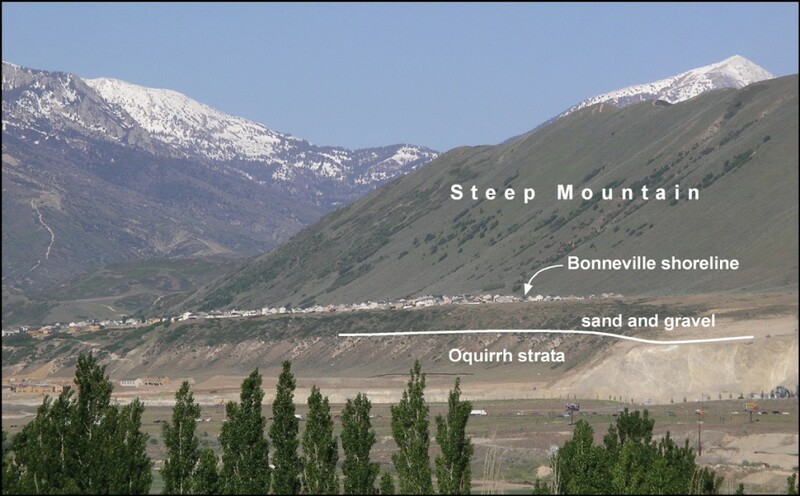 In the west Traverse Mountains west of Jordan Narrows, and in the adjacent Oquirrh Mountains and Lake Mountain, Oquirrh Group rocks are folded into several northwest-trending anticlines (upwarps) and synclines (downwarps), much like a folded rug. These folds are part of the deformation associated with the Cretaceous to early Tertiary (about 140 to 50 million years ago) Sevier orogeny, the mountain-building event caused by the collision of the North American continent and the Farallon (ancestral Pacific Ocean basin) plate. During this time, great thicknesses of rock from the basin were folded and thrust eastward over both correlative and younger rocks deposited on the continental shelf. 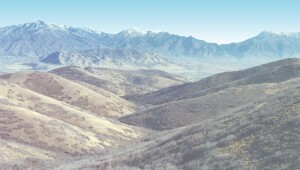 The Traverse Mountains are part of the now faulted and dismembered upper plate of the Charleston-Nebo thrust sheet, which reveals about 25 miles of eastward displacement; the Charleston thrust, since reactivated as the Deer Creek detachment fault and later as the Fort Canyon fault as described below, trends east through Corner Canyon to Heber City and beyond. In the west Traverse Mountains, these folds culminate in the Tickville anticline, which formed above the smaller Beef Hollow thrust. East of Jordan Narrows, equivalent rocks contain few marker beds and are so badly shattered by all this faulting that no folds are recognizable. The subduction of the Farallon spreading center and development of the San Andreas transform boundary between the North American and Pacific plates signaled the end of the Sevier orogeny. In north-central Utah, this occurred in Eocene time, about 40 million years ago. With the end of compressional deformation came collapse and erosional stripping of the Sevier orogenic highlands. The thrust belt collapsed westward along lowangle detachment faults, placing younger rocks on older rocks. The Deer Creek detachment fault is one such fault in which the upper plate slipped westward about 4 miles during the period from about 40 to 20 million years ago. The white garnetbearing marble exposed north of Alpine, which is metamorphosed Mississippian Doughnut Formation, was transported from its original position near what is now Silver Lake high in the Wasatch Range to its present position by movement on the Deer Creek fault. Volcanism accompanied the collapse of the Sevier orogenic belt, and in the Traverse Mountains produced three groups of volcanic rocks deposited over a landscape of eroded Paleozoic strata. The oldest group, at the west end of the range, erupted from the Bingham volcanic center about 37 to 40 million years ago. The volcanic cone that must once have towered above the Bingham Copper Mine has long since been eroded away. A gap of several million years separates the Bingham volcanic rocks from overlying younger volcanic rocks. This younger volcanic suite – which consists of 30- to 33-million-year-old andesitic to dacitic block and ash flow tuffs, lava flows, and intrusions, a rhyolite plug dome, and a separate rhyolite lava flow – erupted from a number of vents in the west Traverse Mountains, including South Mountain, Step Mountain, Shaggy Peak, and possibly unknown vents now buried beneath southwestern Salt Lake Valley. The age and trace-element chemistry of the third group of volcanic rocks, those of the east Traverse Mountains, suggest that they may have erupted from the eastern part of the Wasatch intrusive belt, and so may be more closely related to the Keetley Volcanics of Kamas and Heber Valleys than they are to the volcanic rocks of the west Traverse Mountains. East Traverse Mountains volcanic rocks are made up principally of 35- to 37-million- year-old block and ash flow tuffs and few lava flows. The volcanic rocks are typically deeply weathered such that resistant volcanic boulders accumulate at the surface. Due to hydrothermal activity possibly associated with intrusion of the Little Cottonwood stock about 30 million years ago, locally these volcanic rocks were completely altered to massive silica, creating a colorful but brittle opalite that grades outward to clay-rich rock. Weathering of these volcanic rocks contributes to significant landslide problems in the east Traverse Mountains. Aligned as they are east-west, the Traverse Mountains trend perpendicular to most western Utah mountain ranges, yet they are part of the same tectonic regime that created the northtrending basins and ranges of the Great Basin. They owe their anomalous trend to an inherited, long-lived tectonic boundary (the Cheyenne suture zone) between the ancient Precambrian Wyoming, Mojave, and Yavapai Provinces, now manifested as the Uinta-Cottonwood arch. It is this pre-existing east-west-trending zone of crustal weakness that influenced the location of the Charleston thrust and Deer Creek detachment faults, and that now lives on in the anomalous orientation of the Traverse Mountains. This ancient zone of crustal weakness also coincides with the Fort Canyon fault, which links the Salt Lake and Provo segments of the Wasatch fault. These two segments have different rupture histories, but both are characterized by impressive composite fault scarps tens of feet high; at Corner Canyon, the Lake Bonneville shoreline is offset about 65 feet across several splays of the Salt Lake segment of the Wasatch fault, and at Dry Creek, glacial moraines are similarly cut by the Provo segment. The Fort Canyon fault has no such readily apparent scarps due to its low angle and oblique slip. However, like the better known segments of the Wasatch fault, the Fort Canyon fault is active and shows evidence of late Holocene surface- fault rupture. It is readily discernable as a wide trough at the base of the Wasatch Range where it juxtaposes volcanic rocks and basin-fill deposits against the Little Cottonwood intrusion. Studies of unusual fault-generated rocks at Corner Canyon show that faulting there began by about 18 million years ago. The Traverse Mountains are girdled on all but their topographically high northeast and west ends by deposits and landforms of the Bonneville lake cycle. Lake Bonneville was the largest Late Pleistocene lake in western North America and rose and fell throughout its transgressive/regressive cycle from about 30 to 12 thousand years ago. At its highest (Bonneville) level, the lake covered about 20,000 square miles of western Utah and parts of adjacent Nevada and Idaho and was about 1000 feet deep near the present Great Salt Lake. The Bonneville shoreline is spectacularly etched into the north flank of the Traverse Mountains, particularly at Steep Mountain. The Traverse Mountains used to be a barrier, the crest of the range separating two metropolitan areas. However, development in the east Traverse Mountains, and in the foothills surrounding Camp Williams in the west Traverse Mountains, has had the effect of making the range more accessible than ever before. The Traverse Mountains are low in elevation only compared to adjacent ranges; they reach nearly 2000 feet above the adjacent Salt Lake and Utah Valleys and offer splendid views in all directions: north to the sprawling urban and sub urban grid of Salt Lake Valley, east to the Wasatch Range, south to Utah Lake and the wave of development creeping northward in Utah Valley, and west to the Oquirrh Mountains and western valleys not yet blanketed by development. It is not surprising that the area is now becoming a refuge for affluent Utahns seeking to escape the hassles of urban life. It remains for city and county officials, developers, and ultimately an informed public to make wise land-use decisions, based in part on an understanding of local geology. 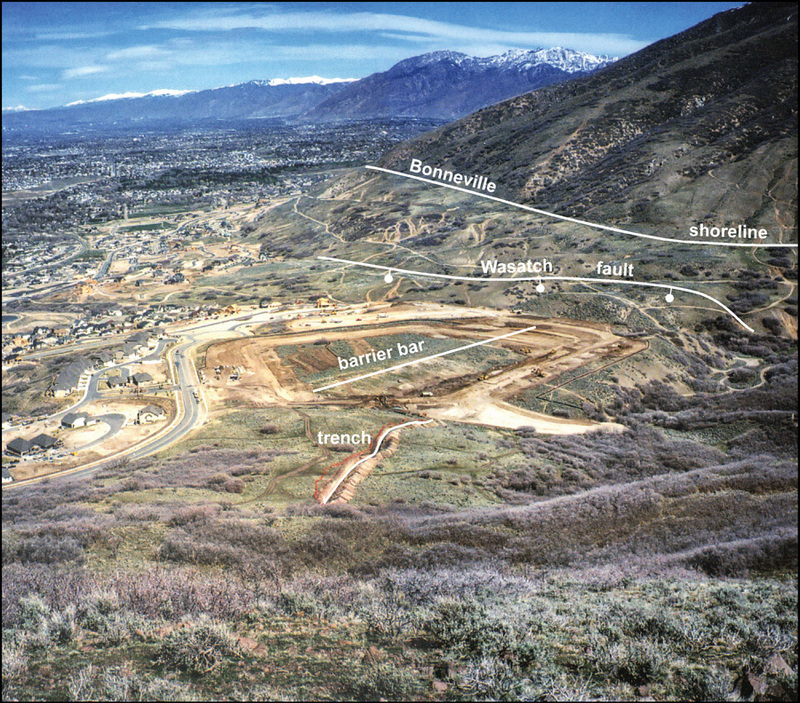 The region still contains some of the Wasatch Front’s best sand and gravel and aggregate sources needed to support local construction; it still produces clay used to make brick and other structural clay products; and it is host to a variety of geologic hazards, including landslides, debris flows, and active earthquake faults, among others. Planning, based on detailed geologic maps, is the single most cost-effective way to mitigate geologic hazards and ensure the wise use of geologic resources, and nowhere is this truer than on the fringe of major urban corridors. The new geologic maps of the Traverse Mountain region (see sidebar) will aid local communities in crafting effective landuse policies. Energy News: “Elephant” Discovered in Central Utah? Glad You Asked; What is Utah’s State Soil?